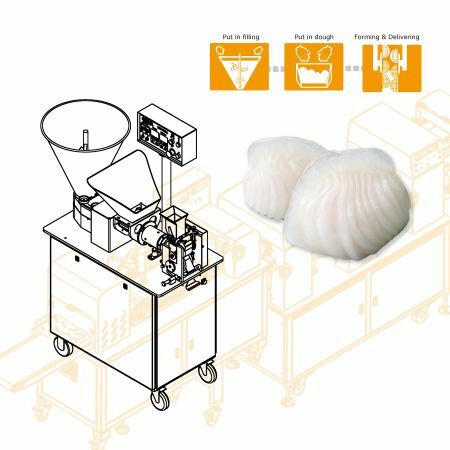 Hargao Machine and Equipment - ANKO High Efficiency Hargao Production Equipment Design | ANKO FOOD MACHINE CO., LTD.
ANKO's Encrusting and Filling Machine is redesigned and upgraded with special equipment to facilitate the mechanical production of traditional hargao, as well as larger shrimp dumplings weighing 25g and 30g. 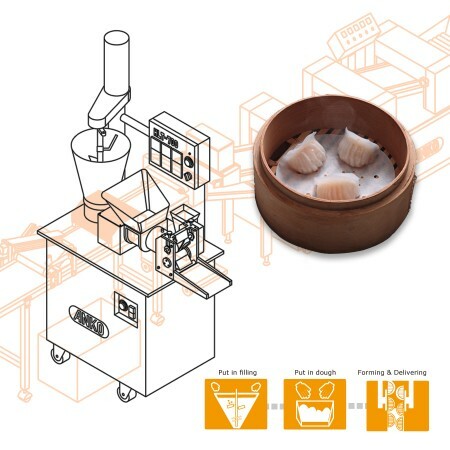 Compare to other machine models, ANKO's Hargao machine is able to encrust the shrimp fillings with minimum damage to the dumplings appearance, and after steaming the final product, a hint of rosy color from the shrimp is revealed through the semitransparent dumpling. ANKO's Hargao machine had successfully improved the productivity and efficiency in hargao making, not only it helped putting a new product in the frozen food category in the supermarkets, but also made hargao from a restaurant delicacy into a household convenient cuisine. Hargao is a scrumptious dim sum dumpling, made with semitransparent wrap and stuffed with shrimps. Some believe that the first hargao was made in a teahouse in Guangzhou around the 1920s to 1930s; the chef filled a gluten-free wrap with shrimps, and then folded 12 times into a delicate shell-shaped dumpling. After steaming, the shrimp dumpling was semitransparent and delicious, it was a popular item amongst the customers, and nowadays hargao had become a must-have dim sum when going to the Cantonese teahouses. The machines listed below are designed for making Hargao. Please feel free to contact us via the form below. We will happy to answer any questions you may have regarding our products, services, and turnkey projects.